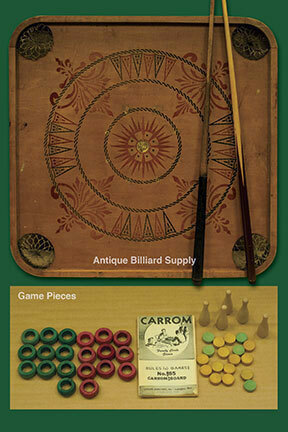 #10-14 Vintage two-sided carom board, perfect to display with an antique pool table. Manufactured in 1946, includes playing pieces, cue sticks and original rule book which describes the many games that are possible. About 29 inches square, original pockets are intact. Excellent condition.